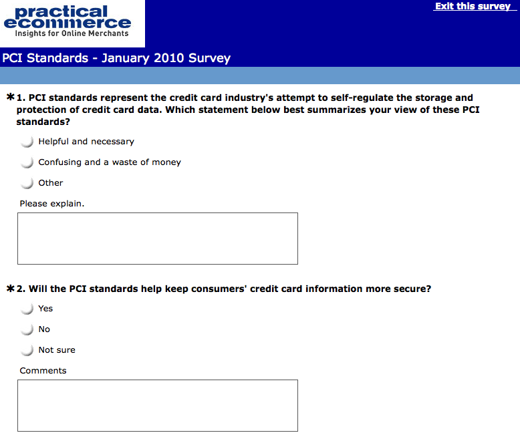 Our January 2010 reader survey addressed PCI compliance, the self-regulatory attempt by the credit card associations (Visa, MasterCard, American Express, Discover and JCB (Japan Credit Bureau)) to protect consumers’ credit card information. The credit card associations say that any company that collects credit card payments from their customers must comply with the new standards. The level of compliance increases with larger companies. Smaller companies can comply with a self-questionnaire, in many cases. Virtually all ecommerce merchants must comply in some fashion. No responsible merchant doubts the necessity of protecting consumers’ credit card data. But many merchants are confused by the new standards and they wonder about their effectiveness. Our January 2010 reader survey asks about this. The survey consisted of four questions and a comment section below each question. Readers who completed the survey and then provided us with their name and email address were automatically entered in a contest to win a $25 Amazon gift certificate. The contest winner, chosen by a random number generator, was Staci Schipporeit. Partial screenshot of January 2010 reader survey. Selected comments to this question are listed below. Will the Standards Actually Work? Do You Understand the Standards? Practical eCommerce’s February 2010 reader survey addresses social media and ecommerce merchants’ use of that medium. To complete the survey, and enter to win a $25 Amazon gift certificate, click here >. Take the Survey: Is Your Website Mobile Optimized?